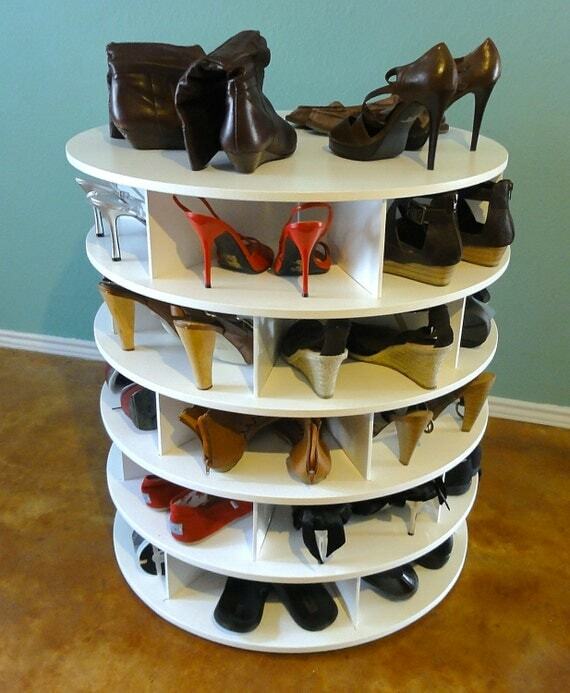 I was on pinterest and found a picture of a lazy susan shoe rack. I cannot find where i can purchase it, and i would rather make it myself anyways. Was hoping someone could look at the picture and give me input on how i could make it. This seems like a great way to save room in a closet. So let's see if we can tackle that project? Instead of getting too wordy, I've decided to draw you some plans out to help you. Well, Jennifer, I hope this helps make your project a success, if you still have more questions feel free to ask away! That's great....I've got to make one to put my sisters 100 pairs. That&#39;s great....I&#39;ve got to make one to put my sisters 100 pairs. Thanks for the schematics! I wanted to make this as a surprise for my fiancee and it's turning out great. What really helped, too, that I'll add is a home-made circle-cutting jig made out of tempered hardboard that I found online. It ensured that the circles were as perfect as I could possibly make them. I still have to paint and drill for final assembly, but I attached two pics here: one of the home-made circle cutting jig, and one of the pre-assembled product before paint and final assembly. And here is the final product for those interested! How many pairs does this one hold? My fiancee has small feet so this holds more of her shoes -- IE she has two pairs in some wedges -- but 4 wedges per row x 5 rows = 20 pairs of shoes. I built one of these 7 stories tall for my daughter. I was wondering if you could tell me how big a lazy susan bearing should be for a 22 inch circular base. I find htem relatively inexpensive upto 12 inches diameter, but the 17 inch diameter one is 6 times the cost.